Welcome to 2019. I hope this new year is welcoming you with ease, joy, support, and nourishment. If this isn’t the case, may the pathways be opened for you to discover all of this (and more). 2019 started off with unexpected health challenges for me and my family. Suffice it to say we’re leaning more than ever into the love and guidance of our healthy ancestors and of Spirit. Being surrounded by wise, tender, ancestral support is valuable beyond measure and my heart is filled with gratitude. 2019 is a Mineral Year. In Dagara cosmology as taught by Malidoma Somé, 2019 is a mineral year… a year when purpose and remembering who we are and why we are here is forefront. This knowing of our specific gifts and unique reason for being alive now lives in our bones (which are composed of minerals). Our ancestors help us find our purpose. This knowing is also carried for us by our ancestors. When our ancestors are healthy, no longer perpetuating a loop of pain and suffering due to unresolved trauma, they help us to remember. They help us remember who we are, where we are from, and the specific gifts we carry. Further, they provide us with the necessary support, courage, and guidance to fully embody these gifts and bring them into the world in meaningful and needed ways. When our ancestors are not yet fully well, it is normal to feel lost, confused, unsure of our gifts or of our purpose. Or, we may have a sense of our purpose but lack the ability to fully manifest our gifts into the world. Sabotage, stuckness, confusion, and apathy reign. Fortunately, the dead can change. And, as they change our lives change as well. To bring this message full circle, I know deep in my bones that I carry gifts as a healer, a ritualist, a teacher. The current challenge my family is facing is bringing forth a deeper version both of myself and my gifts. This wouldn’t be possible without my well ancestors standing strong and loving at my side. 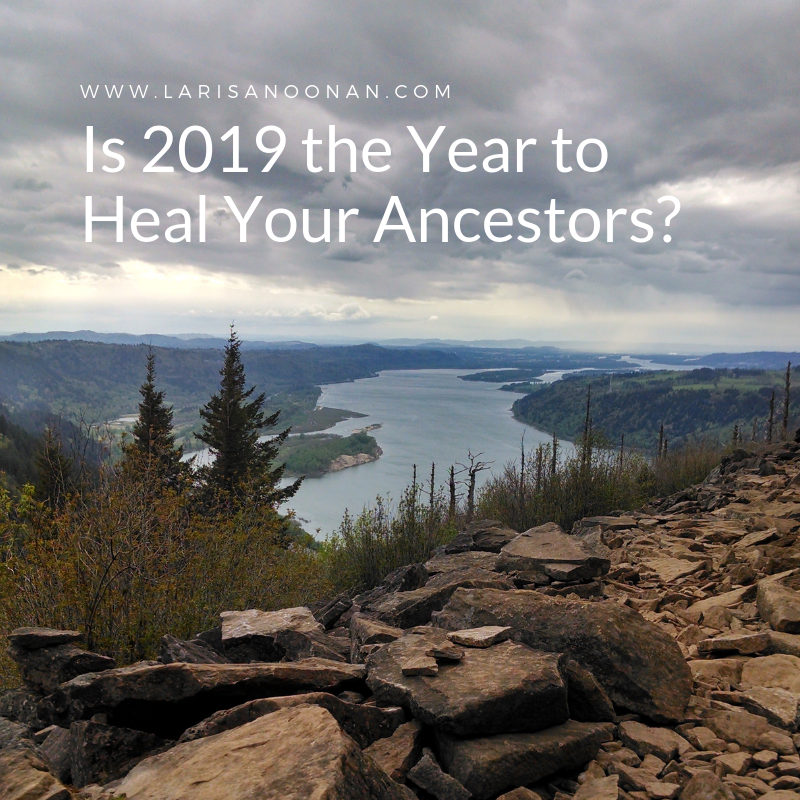 Is 2019 the year for you to also know the full love and support of your ancestors? If so, I warmly invite you to join my upcoming foundational ancestral lineage healing online course. It begins January 28th. You can learn more and register here. *photo taken from Angel’s Rest in the Columbia River Gorge in 2014 – also a mineral year!